After 10+ years as a full blown rotard, I finally bit the bullet and decided to go V8. 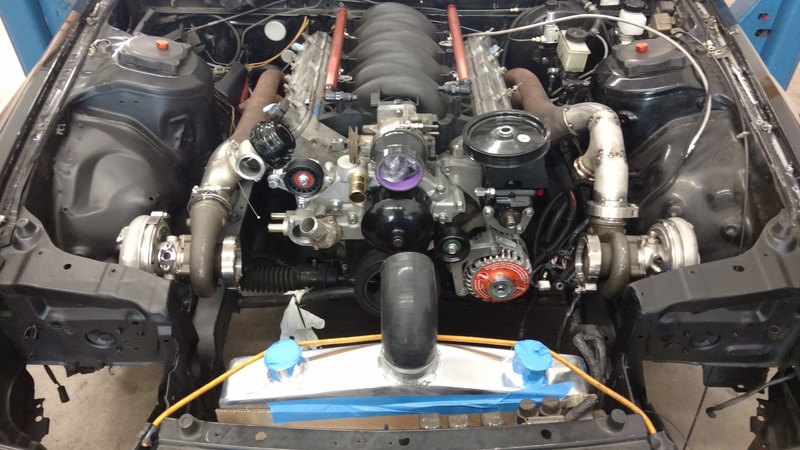 Over the past year, I built a 540whp 13B setup that had been dead nuts reliable, lots of fun, and pretty damn fast. Pump gas and water injection worked great, but I had no room for error at those power levels. I commuted the rotary setup 400+ miles a week and the 13mpg and 2-stroke oil were more than annoying too. I felt like I was a bit on borrowed time, so I quit while I was ahead and sold everything before it blew up. 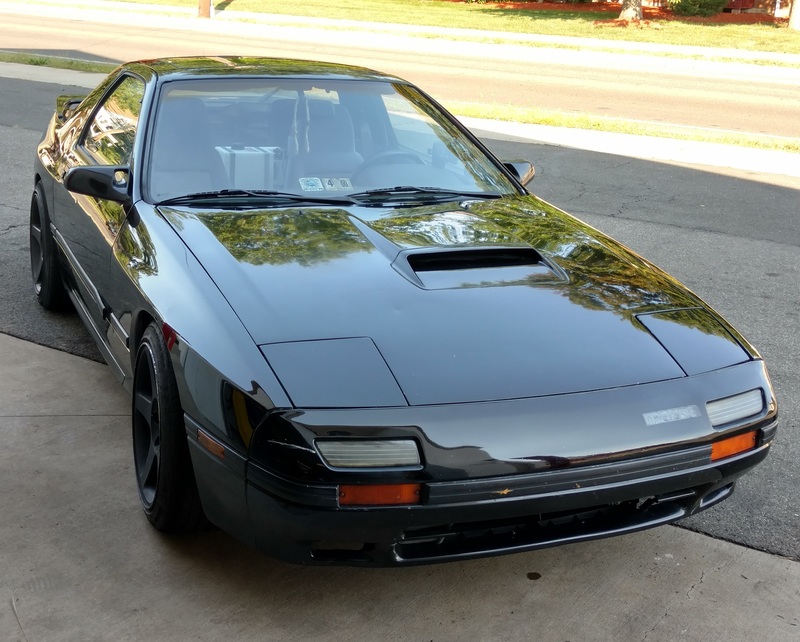 I really wanted a fast, fun, and reliable street car without the inconveniences of a strung out rotary. 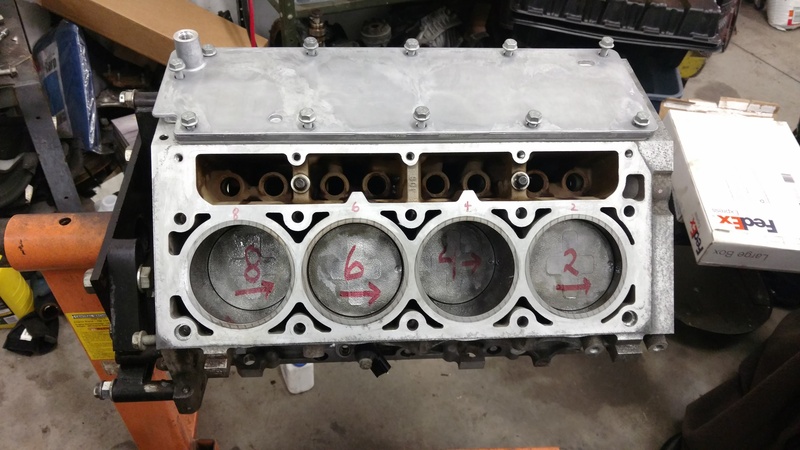 After buying the LC9 engine and heads, I pulled the entire rotating assembly apart, cleaned, inspected, and reassembled with new rings and gaskets. I was really surprised with how clean the engine was. There were no smooth spot in the bores and nice crosshatching still present. I was happy to see a collapsed Displacement on Demand lifter which is most likely why the engine was pulled from the vehicle for replacement. I put new Mahle rings gapped to ~0.028” and buttoned everything back up. To delete the DOD, I bought a Gen4 4.8L valley cover, LS7 lifters, a new cam (BTR Stage 2 Turbo cam), BTR dual valve springs, and a Summit billet 4X 3bolt cam gear. 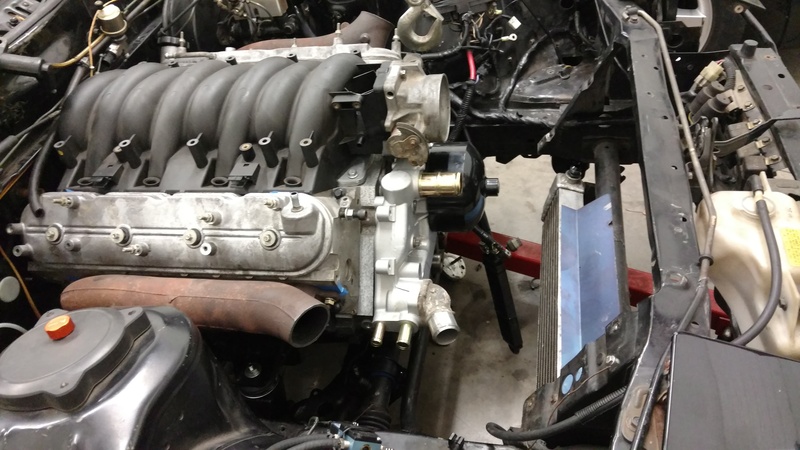 I also put on a Fbody oil pan, Improved Racing baffle set, and LS6 intake manifold. 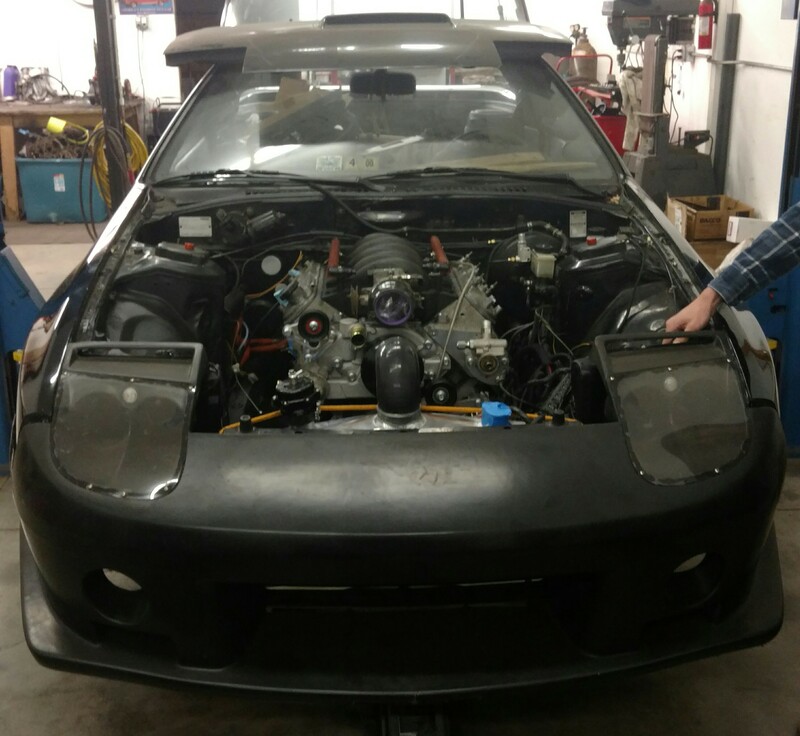 Everything is mounted in the car with a Ronin kit - engine, trans, and diff. Nice looking car and setup! I used to hit ~30 mpg on E85(!) in my turbo LS1/T56 FC. That was highway with 3.08 gears, but still. 25-30 mpg on gasoline with a 3.73 rear should be cake. That'll be a fun car! I'm not opposed to the idea of new gears, but it's one of the few things I don't have the equipment or experience to do myself. I honestly haven't even opened my 8.8 up yet since it's sitting under my work bench, but it has "3.73" sharpy'd on the side of the case. I'm sure it could use new clutch packs too, I just have a ton of other stuff to do first. Sweet looking car too. It's crazy how much more real estate there is in an FC engine bay. How come you aren't using the built-in bypass on the EFR turbos? You may find the w/g on those turbos need upgrading, the 911tt guys who run EFR usually have to upgrade them. I can dig up info on that if you want. Looking forward to how this build goes, I'm jealous! 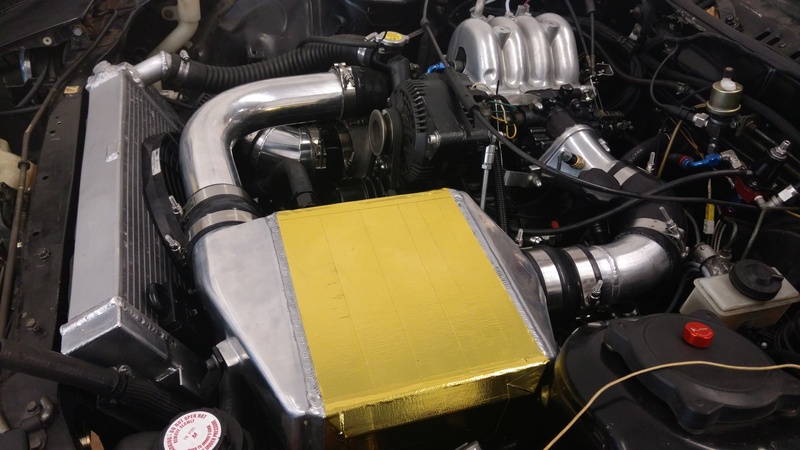 Thanks, The Indycar turbos have class-specific compressor and turbine covers. I had an internally gated EFR on my rotary and the boost creep was part of the reason I V8 swapped it. I had the sickest turbo kit out there and couldn't run boost low enough for pump gas safely (it'd creep to 19+psi on a 7psi spring!) I did like the integral blow off valve, but these turbos don't have that either. 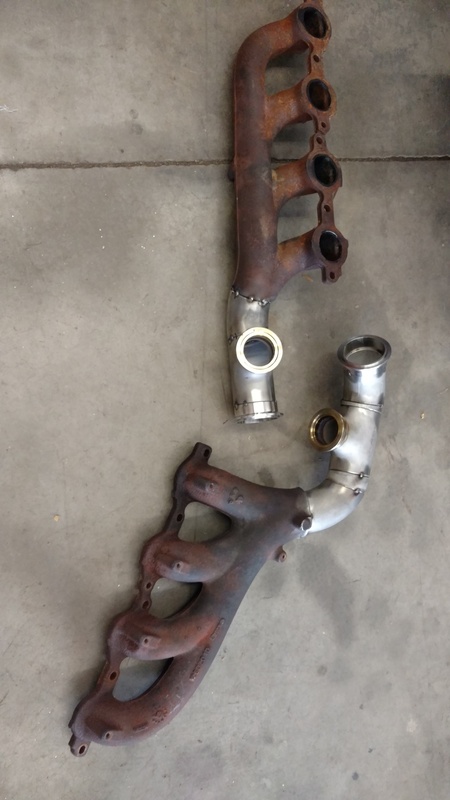 I already have the hot side fabricated and will post up photos later, but I have twin 44mm wastegates, so hopefully boost creep won't be an issue. That's one clean fc you have and sounds like an awesome build! 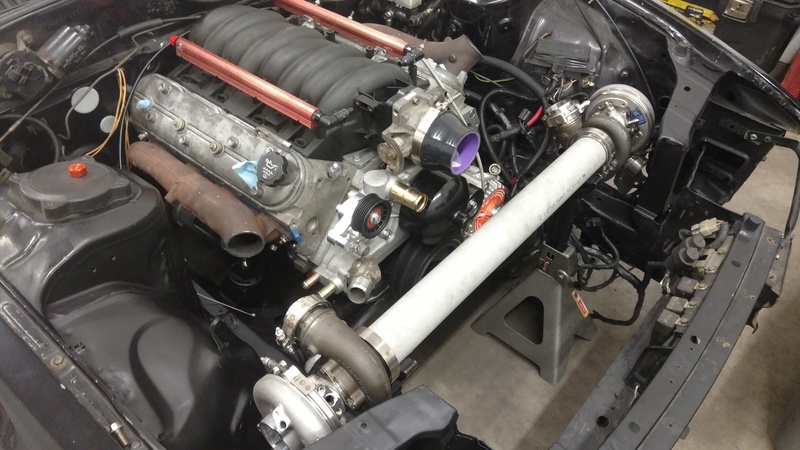 I originally want to go single turbo to reduce complexity and make running a full exhaust much easier. But I found a deal on a pair of used Indycar turbos that I couldn’t pass up. I’m originally from Indiana and got my engineering degree in Indianapolis and fortunately still know a few guys who went on to work for Indycar teams. The turbos I got are Borg Warner EFR 6758s which were the spec twin turbo on the 2012-2013 for V-configuration Indycar engines. Ironically, I ran the EFR 9180 on my rotary which was the spec turbo on the single turbo Indycars of the same era. Borg Warner mandates that the turbos be replaced after 3000 miles. 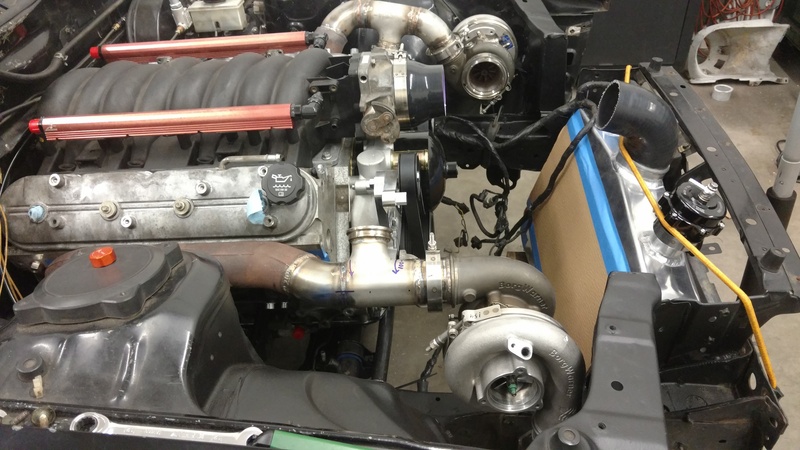 I’ve been told that in 5 years of competition, there have been zero turbo failures. The EFR 6758s are comparable to a GT3071R in size and capacity (54/68mm compressor, 58mm/51mm turbine, 53lb/min flow). It also has an aluminum bearing cartridge and weights only 11lbs! 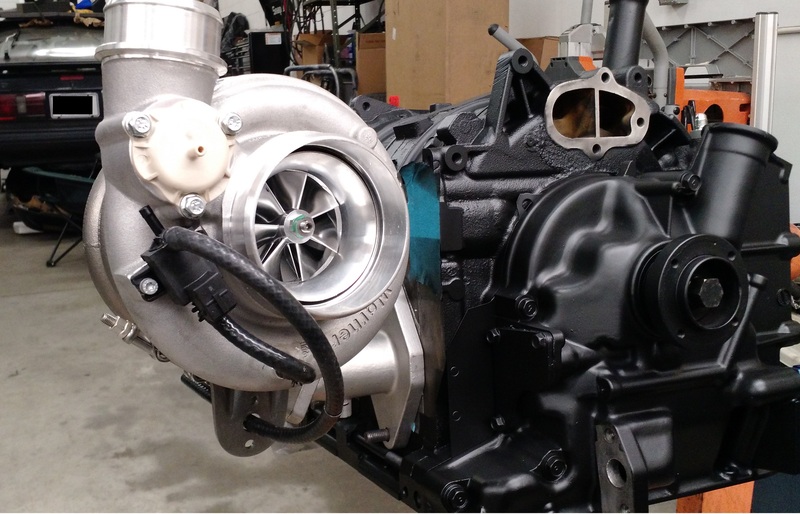 For those who don’t know, the Borg Warner EFR turbos are the fastest spooling turbos on the market. They have a titanium-aluminide turbine wheel that’s about half the weight of a conventional Inconel wheel, and dual ceramic ball bearings. The EFR 9180 on my rotary had unreal response and an almost 5000rpm powerband in boost. The EFR 6758s are honestly probably a bit small on the 5.3L, but for the price, I couldn’t pass them up. They’ll likely make more tq than power as the turbines are on the small side for a V8. 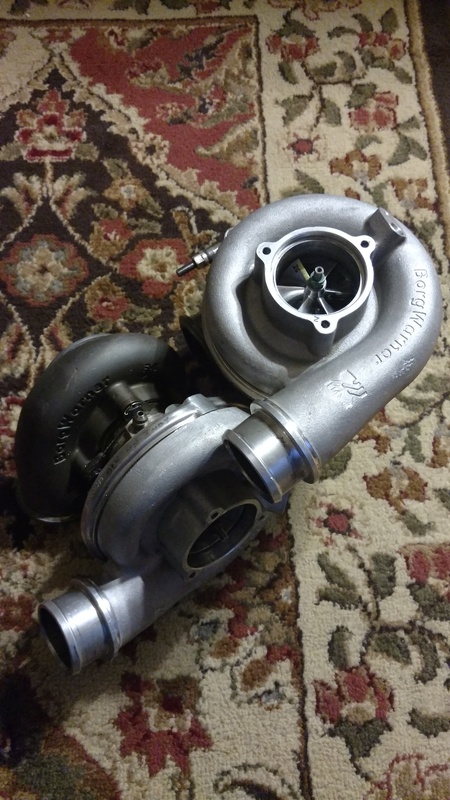 If I can get my hands on the current Indycar turbo (EFR 7163), they’ll be nearly a drop in replacement for my current turbos and good for another 200whp. In an attempt to retain factory-location alternator and power steering, I used truck exhaust manifolds flipped forward and up. This makes changing plugs a pain, but not impossible. I’ll definitely have to run plug boots to keep from melting wires though. 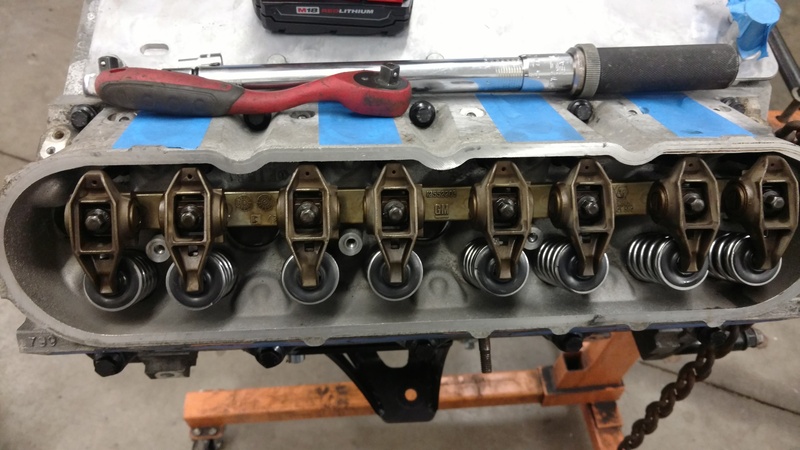 I cut, fit, and tacked the manifolds and had a talented friend TIG weld everything to make it strong and pretty. 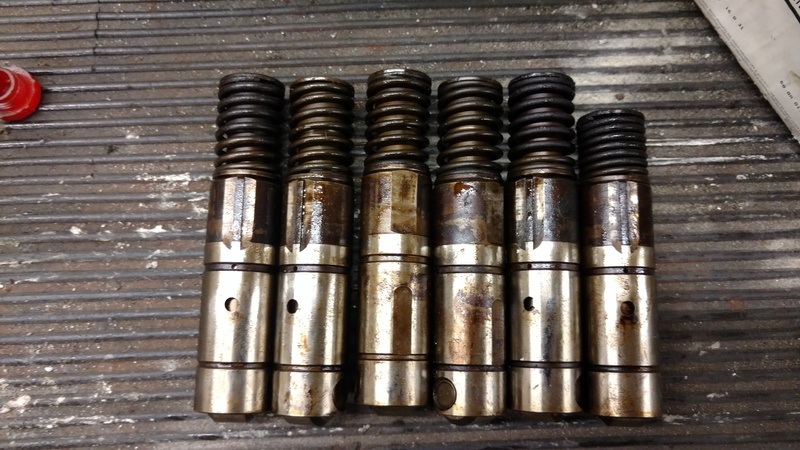 I used SCH10 304SS 2” PIPE els and tees. The only issue I had was the passenger side wastegate hit the tensioner after I had it welded. I cut it and clocked it 90* towards the tire which fits, but makes it nearly impossible to re-circ the wastegate into the downpipe. 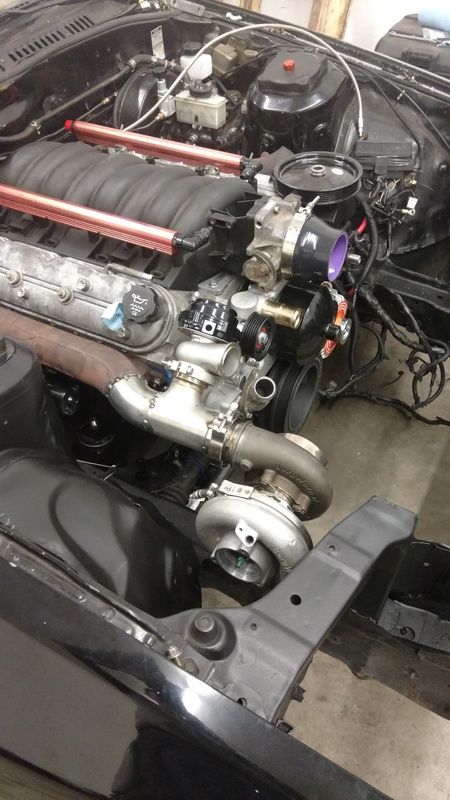 So, screamer pipes out the hood may happen. I really like keeping the car low-key, but I don’t think it’s going to happen this year. For now, I’m using VS Racing 44mm wastegates. Before I invested $700 into Tial MV-Rs, I wanted to make sure everything would fit, not boost creep, and that I wouldn’t change the entire setup 6 months later which is standard for me. For the intercooler, I was torn between the Treadstone TR9, CX Racing IC0011-Bigcore. My friend ordered a TR9 and I wasn’t that impressed with the quality over the CX racing which was half the price, so I ordered the CX. And it was backordered. 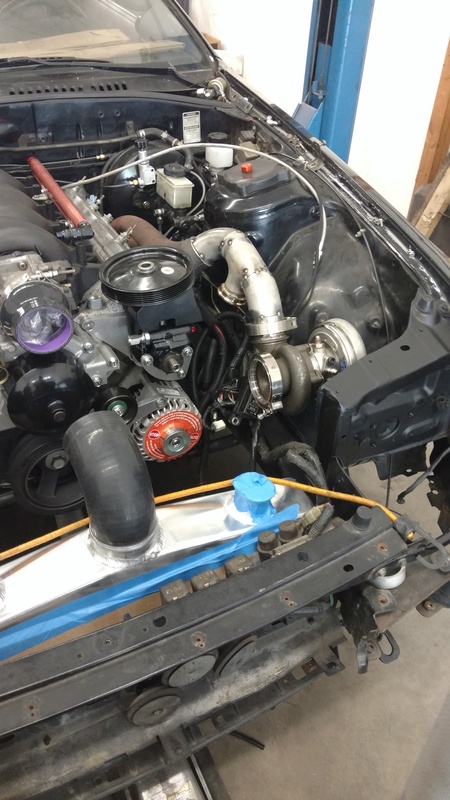 I ended up finding On3 Performance was selling discounted twin turbo intercoolers which were the same core as the CX Racing, but with a top outlet, and twin Tial BOV flanges. 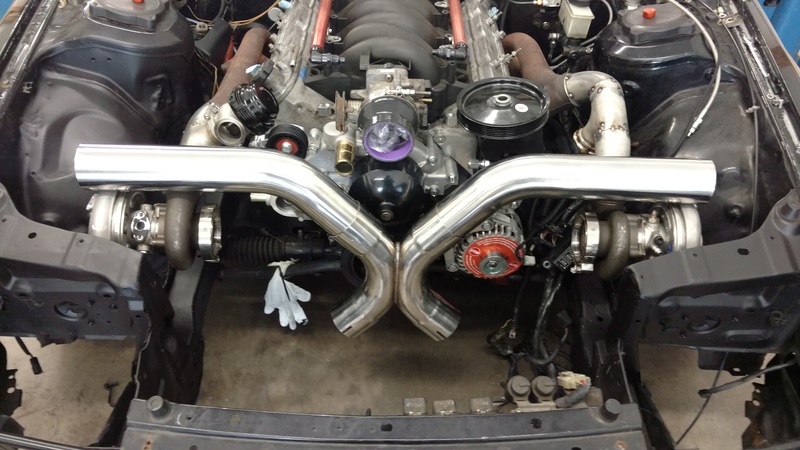 The biggest challenge on the whole twin turbo setup was going to be fitting a full exhaust. After riding in my friends twin S366 6.0L E36 with a fender exit downpipe, I was kinda sold. It’s not terribly loud cruising around, it’s surprisingly not that stinky as long as you’re moving, and it sounds phenomenal in boost. You just have to be cognizant to not whack it in a tunnel or you’ll do serious hearing damage! I ended up finding a cheap F-body 3” exhaust kit with an X-pipe and am going to make a X’d downpipe with it in front of the engine. I also have a few ideas of how to make it quieter for daily driving. My friend finished TIG welding the manifolds this weekend. He had to re-weld the passenger side because the first iteration ended up hitting the manual belt tensioner. I should have checked that with the belt on but unfortunately I did not have the correct power steering pump when I mocked everything up. I also mocked up my Shine Auto Project RE Amemiya front end. I’m glad to ditch the pop up head lights after all these years. They really aren’t adequate on dark roads at highway speeds. With the Shine bumper, I also got someone’s headlight kit that uses OEM Mercedes HIDs in shuttered projector housings. Hopefully they’re bright enough even though they’re lower to the ground and at a worse angle. That's a pretty nice looking setup. 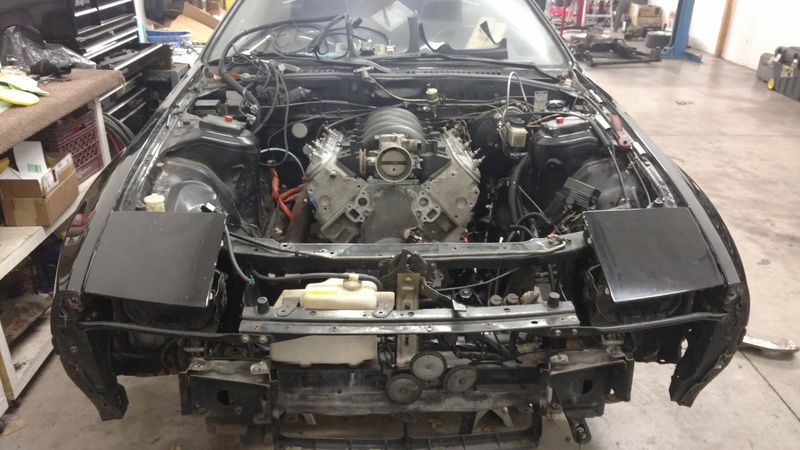 I build something similar (but not as well laid out) on BeasTT's FD originally, back a few years. I worked on one on Kyro's car as well that Speed, Inc. did. Should be a good functioning setup. Don't even bother with 3.73 gears in this. You'll want 3.27 or 3.31 at the very shortest. 3.08 will probably work well. Those small turbos will be fun as hell with the 6 speed, who cares about max #'s in a daily. And as far as gearing, I would definetly go taller than the 3.73. I have 3.55's with a 28" tire and even that is to low for daily driving or highway pulls. Thanks. I think I'll go right for 3.08s and throw a new set of clutch packs in the diff. Is it worthwhile to replace all the bearings while I'm in there? I don't know much about the history of the diff, so probably not a bad idea, but parts start to add up quick. A full Ford diff rebuild kit is $75. The carbon clutch rebuild kit for the LSD is like $110.